While academic libraries in the United States have actively collaborated with each other for more than 100 years, the digital turn has brought an explosion of interest in and pursuit of cross-institutional collaboration. These include large-scale digital access and preservation initiatives like HathiTrust, print preservation and access collaborations like Scholar’s Trust and WEST, metropolitan-level efforts ranging broadly from the Chicago Collections Alliance to MARLI, unmediated borrowing such as ConnectNY, and, of burgeoning strategic importance, the collaborations enabled through cloud-based library services platforms for consortia and systems like Orbis Cascade. These models differ broadly, as do their impact and prospects, but the level of interest and investment is undeniable. Earlier this month, Ithaka S+R published results from the US Library Survey 2016, which examines strategy and leadership issues from the perspective of academic library deans and directors. Since the previous Library Survey cycle in 2013, we have expanded on our coverage of issues related to cross-institutional collaboration after receiving considerable interest for additional exploration of this topic. Results from this survey cycle demonstrate the ways in which academic libraries at differing institution types perceive the importance of and rely on their peer institutions. 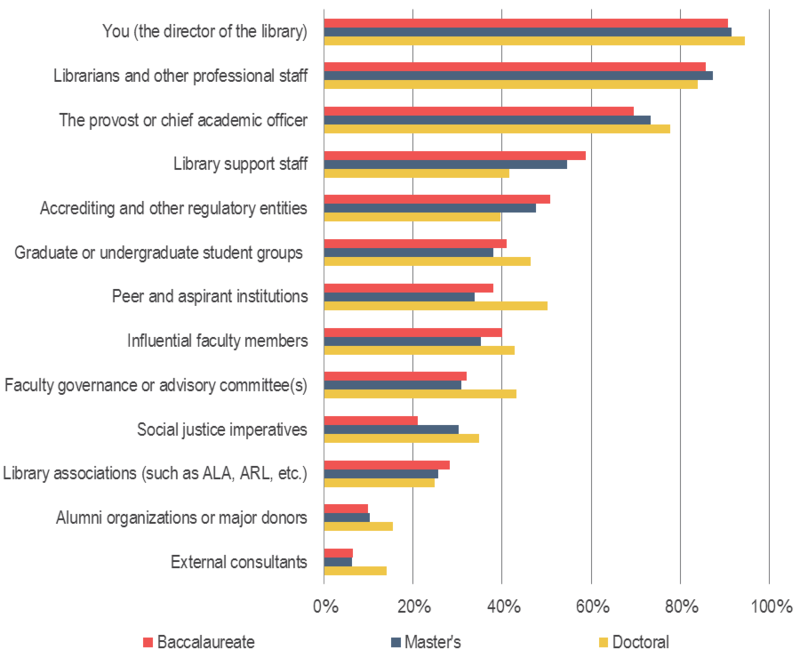 In developing library strategy and priorities, library leaders at doctoral universities appear to be more likely to look to the strategic direction of other institutions. Roughly half of these respondents report being highly influenced by peer and aspirant institutions, compared to approximately one-third of respondents from master’s and baccalaureate institutions. One question this raises is whether there are more clearly defined peer groups for certain types of institutions. ARL, for instance, offers a robust infrastructure for collaboration for larger research libraries. The Oberlin Group provides a similar function for liberal arts colleges. Figure 1: How influential are each of the following in shaping your library’s strategic priorities? Percentage of respondents who indicated that each is very influential. There are also notable differences in the types of collaborative agreements in which these leaders are engaging. While we see all respondents fairly equally valuing collaborative agreements focused on increasing access to resources,, greater shares of doctoral directors consider many additional types of collaborative agreements to be highly important. In particular, those at doctoral universities more frequently indicated that collaborations on shared offsite print storage, digitization and digital preservation, and collection development are highly important. And, results from the survey show that greater shares of respondents from doctoral universities believe their reliance on these collaborative relationships will continue to increase. Figure 2: “How important are the following types of collaborative agreements with other libraries, established through bilateral agreements, library systems, or consortia?” Percentage of respondents who indicated that each is very important. Despite the differing degrees of reliance on peer and aspirant institutions for shaping strategic direction and the varying ways in which these institutions engage with one another, doctoral directors do not report spending an increased share of their time on cross-institutional collaboration compared to leaders at other institution types. Across institution types, library leaders report spending less than 10% of their time on this type of activity. These directors tend to spend the greatest share of their time on administrative and leadership duties, including those related to budgeting, staffing, and management. While directors are spending relatively little time on these collaborations, it is worth asking to which types of employees these responsibilities fall. This is perhaps even more important to understand at the doctoral institutions that rate many of these collaborations as highly important and see their reliance on these collaborations as increasing. These results provide us with a valuable starting point for tracking changes on the ways in which academic libraries engage with one another to share resources and develop services, and we look forward to following up on many of these points in the next cycle of the Library Survey.